An update on the current initial police dog course, only two dogs left. With Jack and Phil successfully graduating in May and Charlie and Simon successfully graduating 2 weeks ago we now have only Arry and Axel left on the course. 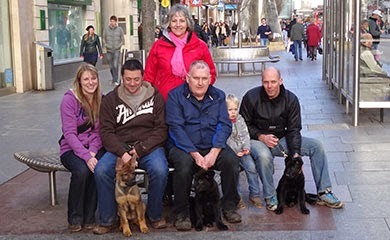 A litter brothers Axel and Arry sitting happily together with their handlers Mark and Carla. 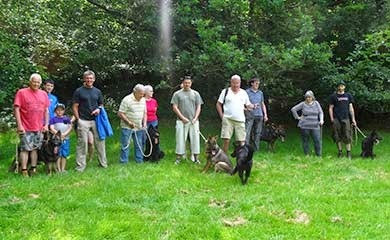 Their training is going very well and I am confident that both will pass their final assessments on the 21st of July. 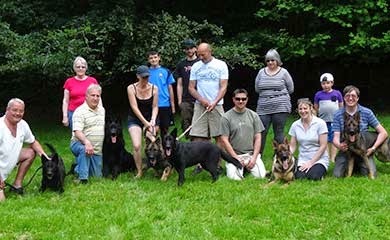 If all goes well we will be holding a passing out parade on Tuesday 22nd July to show off all 4 of the dogs and to say thank you to all the puppy walkers who have made it all possible by the work and time they have devoted to the dogs. 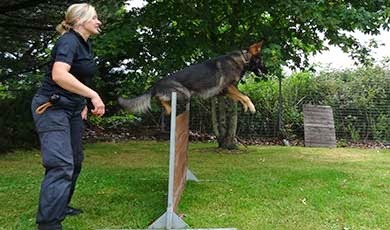 Here are some pictures of the dogs in the last few weeks of training. Carla and Arry on patrol in Exeter city centre. 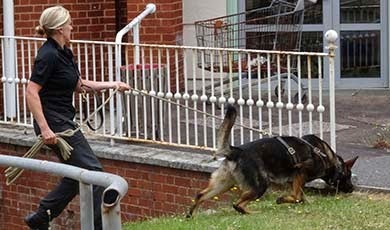 Axel and Mark on the trail of an offender who has made off. 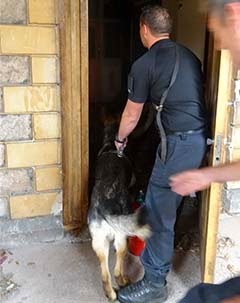 Axel indicating to Mark that he has trailed the offender into the building where he finds him hiding in a cupboard. 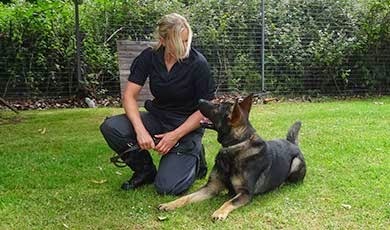 Axel focusing his attention on Mark showing the willingness so necessary in a good Police dog. Arry negotiating the hurdle with ease. 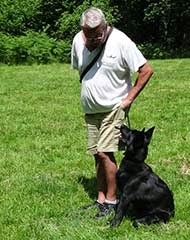 Arry performing a down stay for Carla again showing excellent focus. 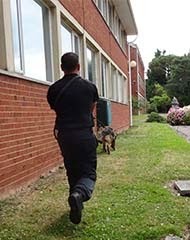 Arry can track across difficult surfaces such as concrete and after an excellent track finds the offender hiding in a nearby building. 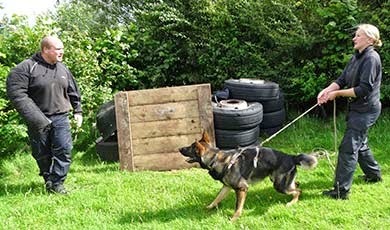 Arry tracking and locating an offender hiding behind a pile of tyres. 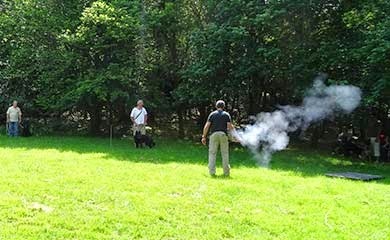 Although it is several weeks ago I thought you might like to see some pictures of the dogs training on a hot sunny day. 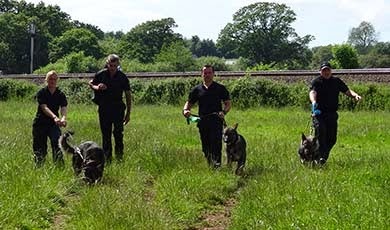 The temperature was well into the mid twenties and under normal circumstances we would never train in hot temperatures because it is very difficult for the dogs to cool down even with air conditioning in the vans. 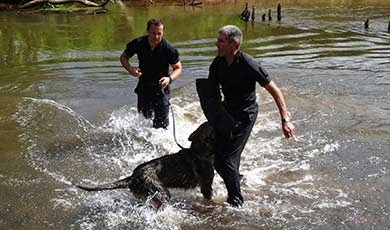 On this particular day we did all the training alongside the river and were able to put the dogs back in the vans already nicely cooled down having had a lot of fun. 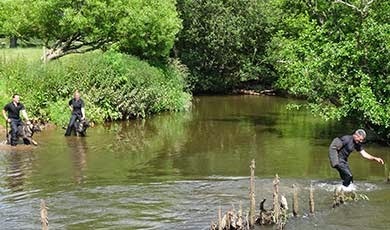 The video shows the handlers getting the dogs used to the water before doing some criminal work in and across the river. The dogs getting used to the water. The dogs getting ready to chase and detain me across the river as I run away. Mark and Axel in hot pursuit. A successful chase with me detained after trying to run away across the field. Criminal work being performed in the water. Making our way back to our vans after a very enjoyable day. 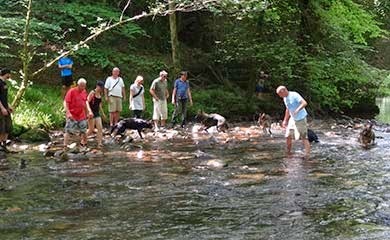 Knowing it was going to be a hot day for our B litter training day on Sunday 22nd of June we held our training in Bickleigh Plymouth in woodland giving us shade and the river alongside to allow the dogs to cool off. 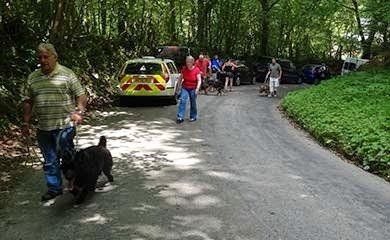 All of us making our way up to the training area with our dogs having parked our vehicles in a shady area. All of us getting ready for the training session. Note how well behaved and sensible the dogs are considering they have just arrived. From left to right are Blade, Boris, Buddy, Bebe, Bruno and Beckie. Note Bebe with her raised tail denoting her confidence and dominance and note how Buddy treats this display with total indifference demonstrating his confidence. The training covered article searching, an introduction to person searching, puppy tugging using a soft towel attached to a line to assess their determination to bite, gun test seeing their reaction to a 38 revolver being fired in close proximity and finally an introduction to obtaining a nice square heel sit position in preparation for future heelwork. Bruno article searching in the woods for a used shotgun cartridge. Blade getting ready to search for a person he has seen go off. Boris watching a towel on a rope being jerked along in front of him. Boris grabbing hold of the towel with real determination and a will to win so necessary in a Police dog. Bebe demonstrating a nice attentive heel sit using a titbit. All the 6 dogs having a 38 revolver fired in front of them and reacting confidently. We then took all 6 pups down to the river for a cool down and finally a picnic to finish a very enjoyable day. The dogs in the river with Colin seeming to enjoy it more than the dogs. 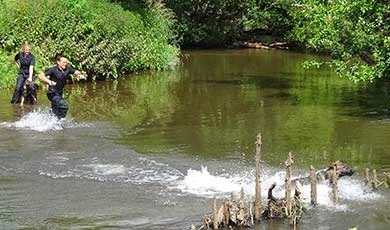 The video above shows all the dogs romping in the shallow river and wearing short lines. The lines are probably unnecessary with this group but it is sensible to have something to grab hold of if behaviour gets too boisterous. Finally all together after our picnic before setting off on our individual journeys throughout Devon and Cornwall after a lovely day together. 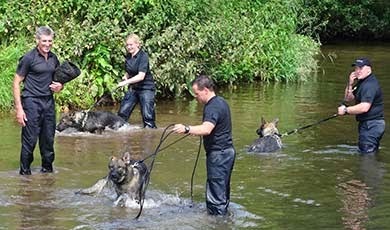 All the pups did very well on their exercises and enjoyed the water together. Preparing our police dogs to be reliable, confident and safe working amongst livestock and patrolling in towns and city centres. How important it is? 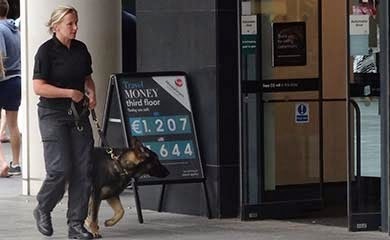 Devon & Cornwall Police dog section have always attached great importance to their dog teams performing high visibility foot patrols in the towns and city centres. 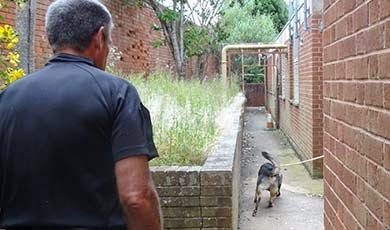 These patrols provide public reassurance and they also perform another vital function ensuring our dogs remain social and safe to approaches from people in day to day situations. Our dogs often have to deal with crowd disorder particularly outside licensed premises and at football matches and so it is important that they remain stable and grounded by not seeing all crowds as a threat situation. 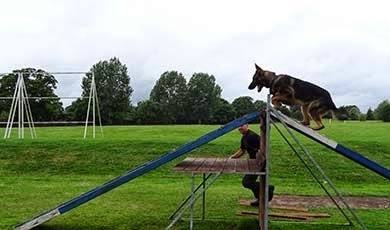 This is why even though it is not part of the National Police dog training Syllabus we include this training on our Initial Police dog Course. This builds on all the good work our puppy walkers do getting the pups used to crowds. 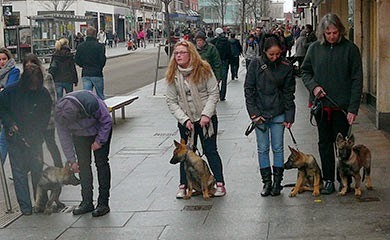 Pictured above are some of our pups undergoing socialisation in Exeter city centre together. 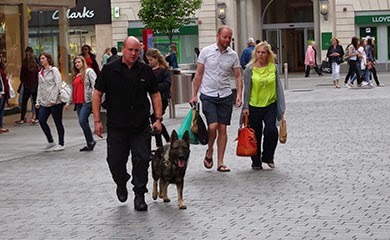 Also pictured is Simon and Charlie on our current Initial Police dog course walking amongst the Exeter city crowds in a totally confident and relaxed manner. Although Charlie is relaxed his handler Simon cannot switch off as he must at all times be watching and looking around for any unexpected situations or surprises such as a skateboarder coming up behind or a loose dog. 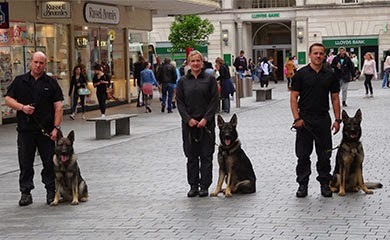 The current Initial Police dog course are pictured here 2 weeks ago undergoing some environmental city centre training. 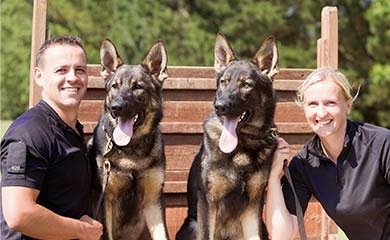 From left to right are Simon and Police dog Charlie, Carla and Police dog Arry and Mark with Police dog Axel. 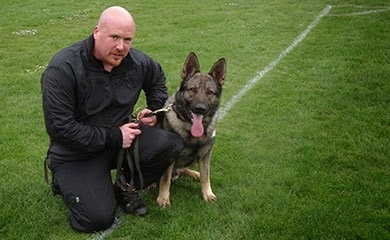 I am pleased to announce that Simon and Charlie have just successfully completed their Initial Police dog course and will be leaving our course as a fully accredited Police dog team to serve in North Devon. 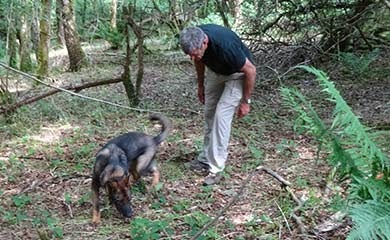 Simon is pictured here earlier in the course with his dog Charlie. 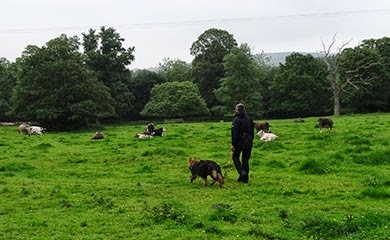 In addition to all the work that is undertaken ensuring our pups and Police dogs are confident and relaxed amongst large crowds we also do a lot of work ensuring that our pups and Police dogs are confident, reliable and not distracted when coming into contact with livestock. 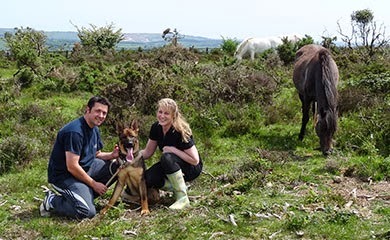 All of the pups in our puppy programme are introduced to livestock in controlled conditions. 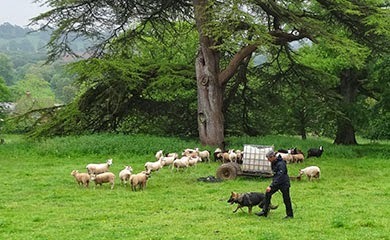 An operational Police dog has to work in rural areas and will regularly come into contact with livestock and it is vitally important that the handler can have confidence that his dog is not going to be distracted from his/her work whether it be searching or tracking outstanding criminals or missing persons. 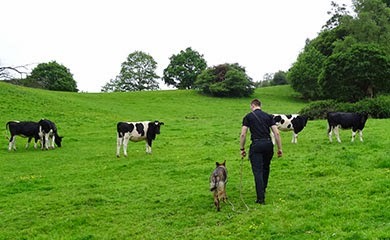 Again working with livestock is not included in the National Police dog training curriculum but because of the large rural areas in our force we believe this type of training will be of real benefit to our operational dogs. 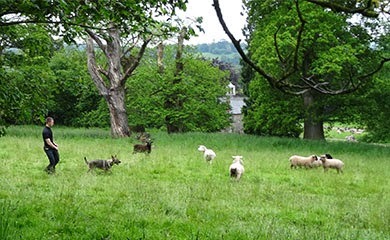 If you refer to previous blogs you will see that in our puppy development programme we already introduce all of our pups to livestock down on the farm. 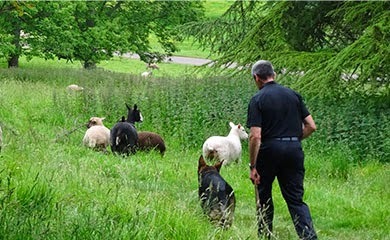 In addition I carry out rural schooling with our pups on a line through sheep, cows, horses and ponies prior to their official Police dog training. I have included some pictures taken this week of Ava from our A litter and Blade and Buddy from our B litter now aged 6 months being schooled through livestock. The above pictures shows Ava calmly walking through sheep and cattle. 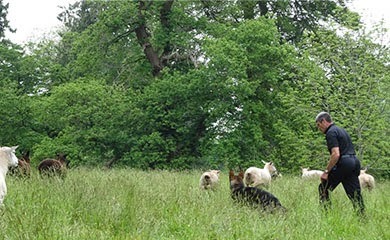 The above picture shows Blade walking through sheep and cattle. 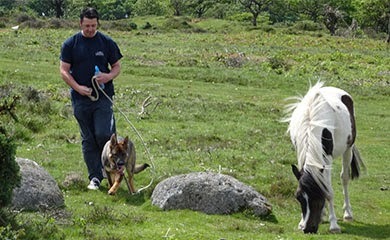 The above shows Buddy with Lindsay and Anthony with the ponies on Dartmoor. 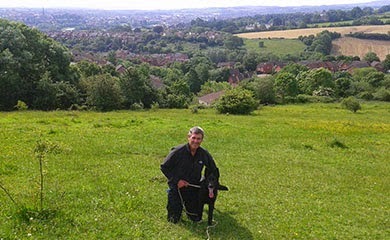 and in the morning here I am doing some work with Molly’s daughter Bebe overlooking Exeter. No article would be complete without the obligatory health and safety item and my blog is no exception. I therefore must point out that walking dogs through livestock comes with potential risks particularly with regard to cattle. 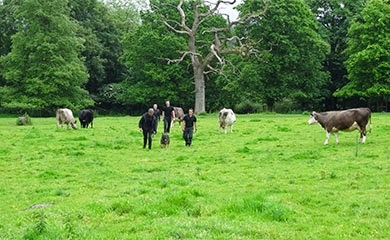 We certainly do not expect our puppy walkers to walk our puppies through cattle and any such training is only carried out with a trained Police dog Instructor being present with the pup. 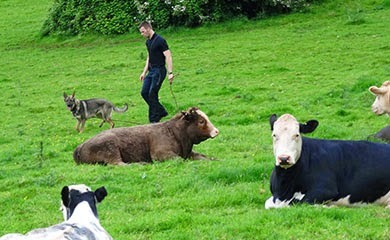 The advice given by the National farmers union holds good to always keep your dog on a lead around livestock and to let go of the lead and dog if chased by cattle. We have access to cattle who are generally placid but as with any animal things can always go wrong. 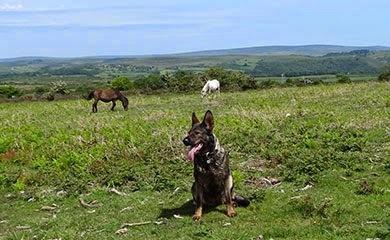 I have no doubt many of you will be interested in how we train the dogs not to chase or attempt to chase livestock because as you will probably realise it is a perfectly natural thing for a dog to want to do if given the opportunity. 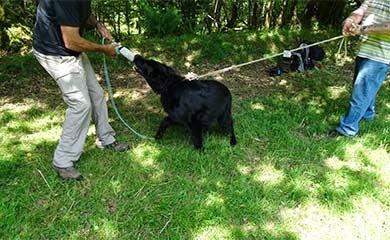 When schooling a dog through livestock the dog is on a 10 foot long strong rope attached to his/her leather collar . The handler holds the rope by the rope handle and the rest of the line trails on the floor. 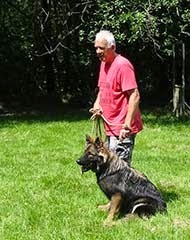 If the dog tries to surge forward the handler stands on the line with a firm ‘NO’ command and the dog will receive a jolt which tells the dog the handler does not like what the dog is doing. 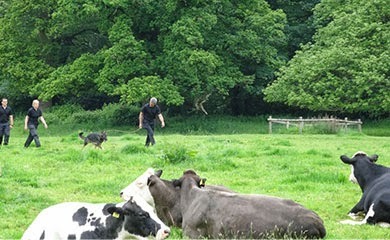 Puppy walker Ed is pictured here with Ava in the perfect position walking through cows. 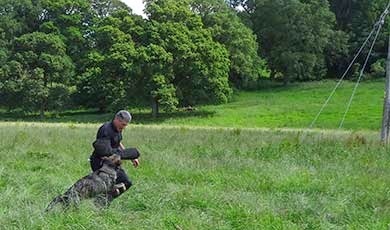 With a persistent dog the handler will hold the end loop with both hands and as the dog hits the end of the line this will deliver a very strong jolt and nearly always stops the dog from repeating his/her actions. 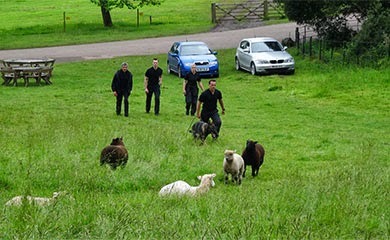 I have included photo’s of Arry and Axel (From the A litter) our remaining 2 dogs on the Initial Police dog course undergoing rural schooling through sheep and cattle approximately 1 week ago. The above show Axel working through cattle and sheep. The above show Arry working through cattle and sheep. Axel was extremely biddable and well behaved in this session and very little force was needed. Arry was not so easily deterred particularly with the sheep and a water spray was used directly into his face and this prevented any further attempts by Arry to chase. We do have other more unpleasant sprays which are not harmful to the dog and are health and safety approved but these are rarely if ever needed. 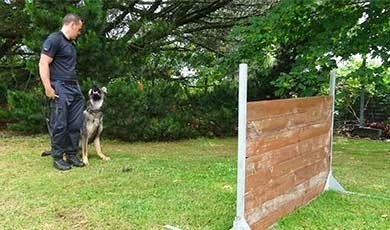 The key to success as is the case with all dog training is patience, perseverance, consistency and repeating the training until the habit is formed. Hope this article has been of interest to you. See you next time.